Many thankx to The J. Paul Getty Museum for allowing me to publish the photographs in the posting. Please click on some of the photographs for a larger version of the image. Daguerreotype 8 x 6 in. Image: 8 3/4 x 6 9/16 in. “The J. Paul Getty Museum presents In Focus: Still Life, a survey of some of the innovative ways photographers have explored and refreshed this traditional genre, on view at the Getty Center in the Center for Photographs from September 14, 2010 – January 23, 2011. With its roots in antiquity, the term “still life” is derived from the Dutch word stilleven, coined during the 17th century, when painted examples enjoyed immense popularity throughout Europe. The impetus for a new term came as artists created compositions of increasing complexity, bringing together a greater variety of objects to communicate allegorical meanings. Still life featured prominently in the early experiments of the pioneers of the photographic medium and, more than 170 years later, it continues to be a significant motif for contemporary photographers. 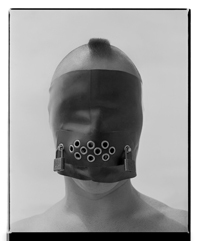 Drawn exclusively from the Museum’s collection, the exhibition includes photographs by Charles Aubry, Henry Bailey, Hans Bellmer, Jo Ann Callis, Sharon Core, Baron Adolf De Meyer, Walker Evans, Roger Fenton, Frederick H. Hollyer, Heinrich Kühn, Sigmar Polke, Man Ray, Albert Renger-Patzsch, Paul Outerbridge, Louis-Rémy Robert, Baron Armand-Pierre Séguier, Paul Strand, Josef Sudek, and Thomas R. Williams. The exhibition is arranged chronologically and includes a broad range of photographic processes, from daguerreotypes and albumen silver prints made in the 19th century to gelatin silver prints, and cibachrome prints made in the 20th century, to digital prints from the 21st century. For Bowl with Sugar Cubes, photographer André Kertész created a still life out of a simple bowl, spoon, and sugar cubes, demonstrating the photographer’s interest in the compositional possibilities of layering basic geometric forms on top of one another – three rectangles in a circle (sugar cubes and bowl) and a circle in a square (bowl and the cropped printing paper). A visual sophistication is achieved through his adroit use of simple objects and dramatic lighting. Other selections from In Focus: Still Life include Edward Weston’s Bananas and Orange, which depicts a symmetrical fan of bananas punctuated by one oddly shaped orange, and Frederick Sommer’s The Anatomy of a Chicken, which uses the discarded parts of a chicken to create a visual commentary. Influenced by Surrealism, Sommer embraced unexpected juxtapositions and literary allusions to express his intellectual and philosophical ideas. 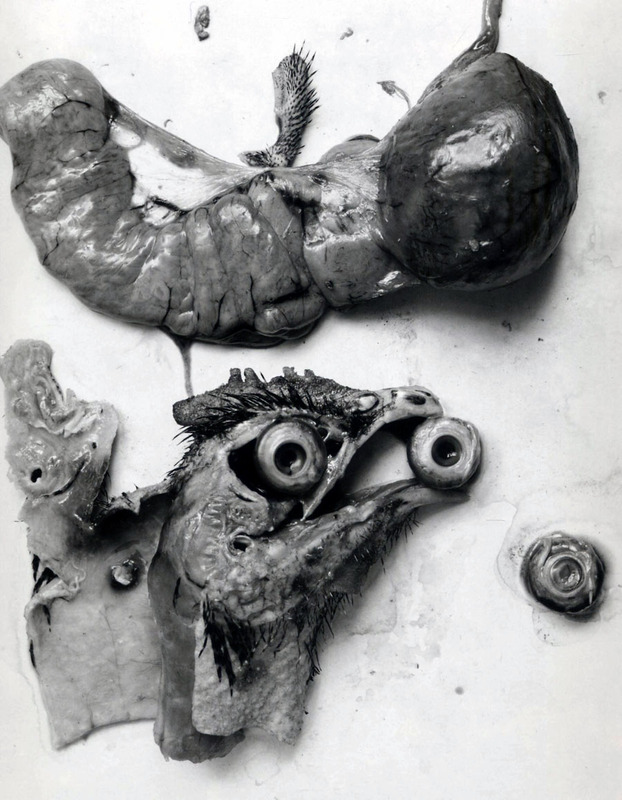 In Anatomy of a Chicken, a severed head, three sunken eyes, and eviscerated organs glisten on a white board. Evoking biblical imagery, medieval grotesques, and heraldic emblems, Sommer calls on the viewer to consider the endless cycle of birth and death, the cruel reality of the food chain, and man’s role in this violence. Image: 9 1/2 x 7 13/16 in. “Still life derives from the Dutch word stilleven, coined in the 17th century when paintings of objects enjoyed immense popularity throughout Europe. The impetus for this term came as artists created compositions of greater complexity, bringing together a wider variety of objects to communicate allegorical meanings. Still life featured prominently in the experiments of photography inventors Jacques-Louis-Mandé Daguerre and William Henry Fox Talbot. They did this in part, for practical reasons: the exceptionally long exposure times of their processes precluded the use of living models. In the late 1830s, Baron Armand-Pierre Séguier, a close associate of Daguerre, created this elegant daguerreotype that features small-scale copies of famous sculptures in the Louvre and Uffizi museum collections. In the mid-1800s, Charles Aubry was an accomplished practitioner of still-life photography who came to the medium by way of his professional interest in applied arts and industrial design. After working as a pattern designer for carpets, fabrics, and wallpapers, he formed a company to manufacture plaster casts and make photographs of plants and flowers. Aubrey’s detailed prints of natural forms – like this close-up of plants on a lace-covered background – were intended to replace lithographs traditionally used by students of industrial design. By the first decade of the 20th century, art photographers like Baron Adolf de Meyer employed soft-focus lenses and painterly darkroom techniques to make photographs that resembled drawings and prints. The vogue at the time was to produce images that reflected a handcrafted approach, while asserting photography as an art medium in its own right. Here, De Meyer photographed an arrangement of objects through a scrim. The pattern of thin, woven fabric softens the backlit objects and helps replicate the subtle tonal effects prized in etchings and aquatints. Several decades into the twentieth-century, the American artist Man Ray emerged as a pioneer of two European art movements, Dada and Surrealism, in which the element of surprise figured prominently. This image seems both unusual for Man Ray in its apparent straight-forward approach, but also typical in its somewhat dark emotional tone. By selecting a dead leaf with a claw-like appearance and photographing it against a wood-grain board, Man Ray updated the concept of memento mori (“remember that you must die”), a motif popular in centuries-old still-life paintings. In that same vein, the best contemporary still-life photographs recall past styles of art while containing a paradox relevant to today. Contemporary photographer Sharon Core became known for re-creations of painter Wayne Thiebaud’s pop-art dessert tableaux. 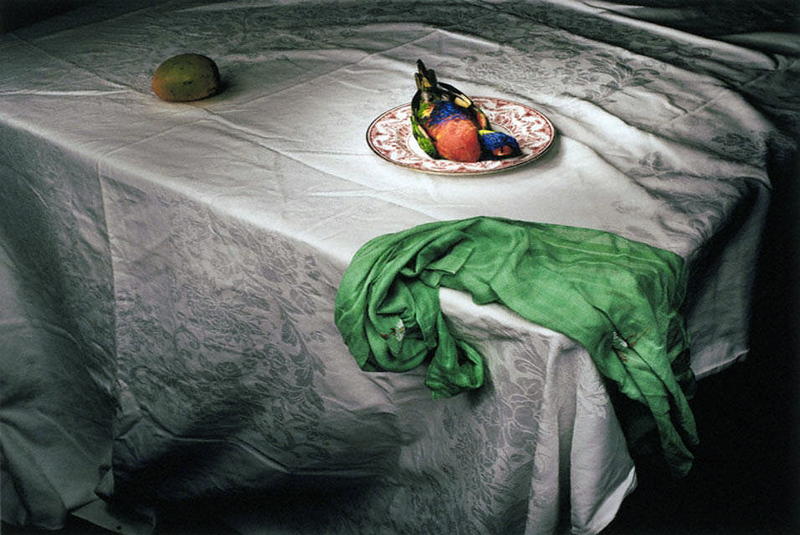 Her series of still-life compositions, inspired by the 18th-century American painter Raphaelle Peale, followed. For this series, entitled “Early American,” Core studied the compositional structure of his paintings, replicated the mood of the lighting, and when she couldn’t find the right vegetables and flowers, grew her own from heirloom seeds. Image: 17 3/16 x 23 7/16 in.